Quite the difference, right?! 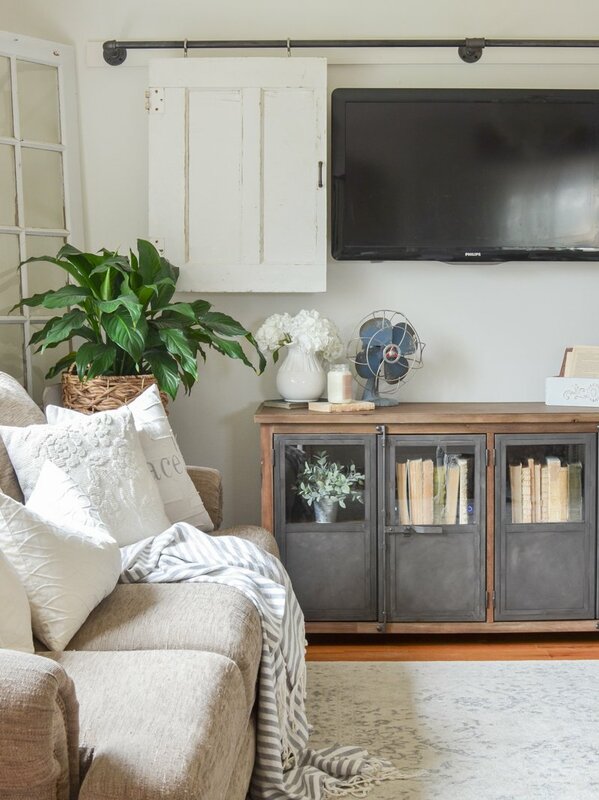 Isn’t it funny how a single piece of furniture can totally change the vibe of an entire space. Every time I walk into our living room now I have to do a double-take because it’s just so different from what we had before. I love it. This cabinet is a few inches smaller than our old one and I think it fits the size of our living room much better. Plus I just love the industrial look. 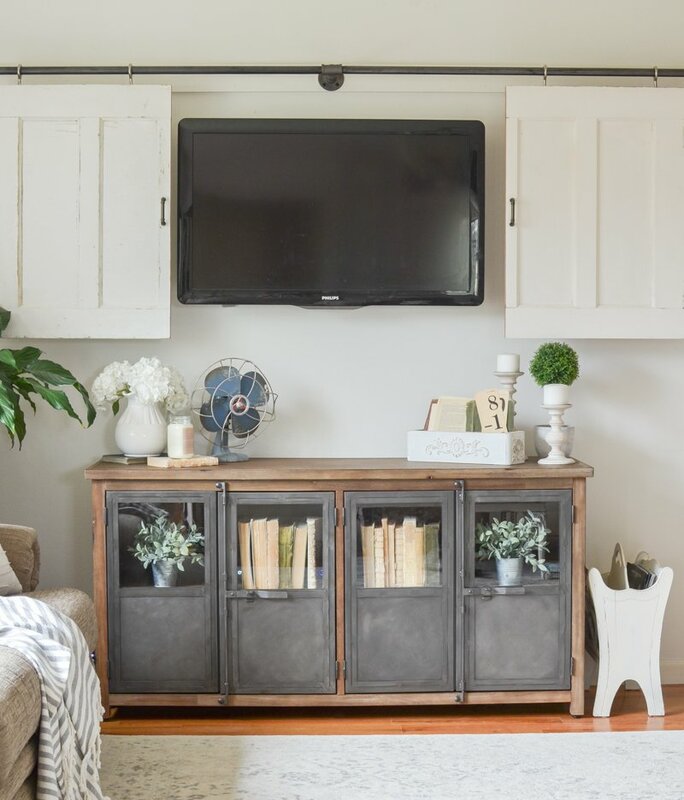 The black metal doors add tons of character and it blends in really well with the rustic vibe of our sliding barn door TV cover. 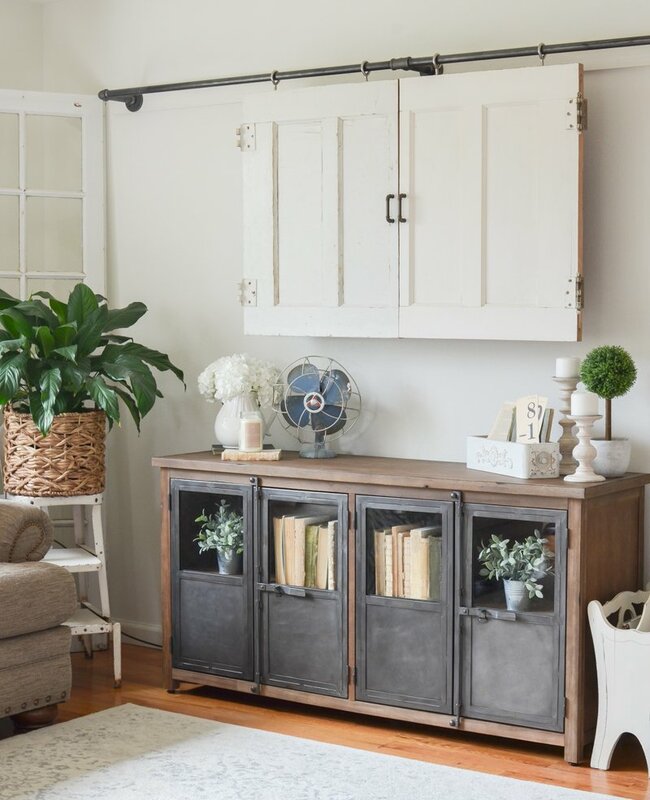 I had so much fun styling this with a few of my favorite things–like those old books, greenery, my little blue vintage fan. I wanted to keep the decor really simple for now, but I’m already thinking about how cute this is going to look with a bunch of pumpkins for fall! Being the overly sentimental person that I am, I was a bit sad to see our old TV cabinet go. It had been with us through a lot of big life changes over these past ten years, so of course I formed an emotional connection to it even though I was tired of looking at that boxy thing. How the heck does that happen?! I don’t know, I guess I’m just a weirdo like that. But either way, it was definitely time for something new. And I do think this console table suits our living room so much better. I love the rustic vibe and the weathered wood warms up this space perfectly! 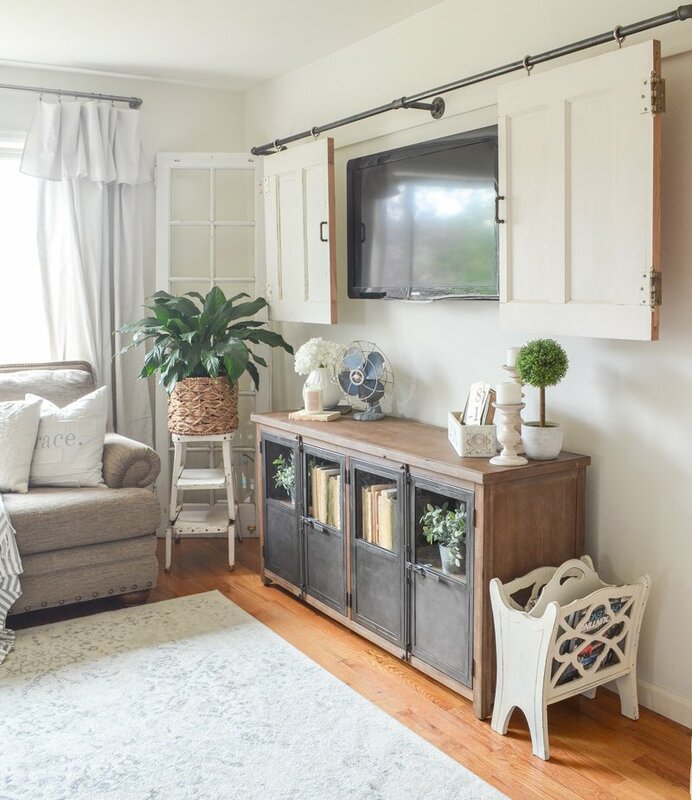 Farmhouse Style Home Office Reveal! Love it! Looks great in your living room! haha I would love to help with your house Becky!! That would be so much fun. 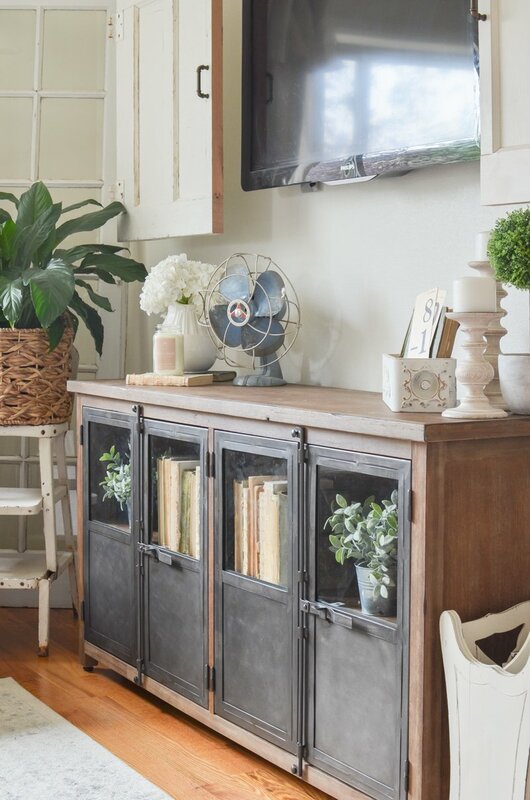 I’m debating about a new tv console as well…I absolutely LOVE this!!! 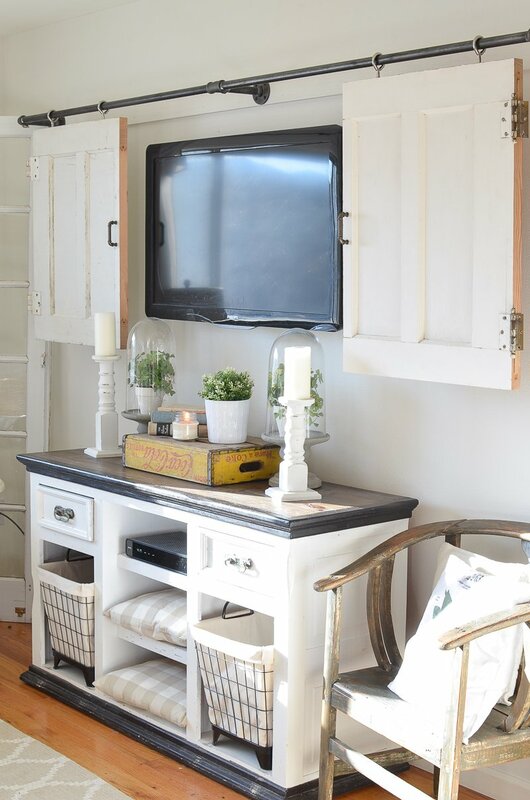 I have a sort of farmhouse/industrial theme and this would fit perfectly. I love how you’ve styled it and I love the look! Thank you Andrea!! I’m so happy with how it all came together. It’s such a cool cabinet! I too get attached to some furniture. I have an armoire from my old house in my reading room at the new house. It’s too big for the space and I don’t have anywhere else to put it but I’m struggling to let it go. I am also ready for pumpkins and mums and all thing fall! I know that feeling very well. Funny how some pieces just pull us in and we can’t let go, even when we should! I love the new cabinet. I love the front doors on it. It looks perfect there. 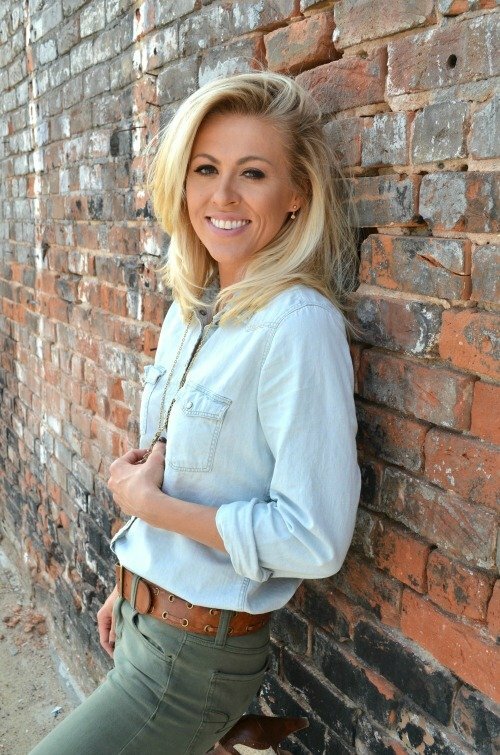 I love how you styled it…but then again, I love all that you do!! Enjoy it friend! 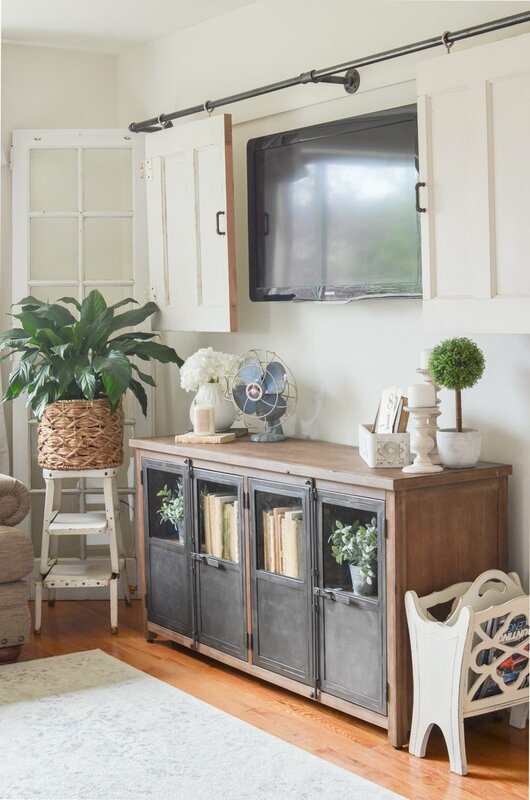 Sarah, love the new tv cabinet, but am waiting to see how you will repurpose the old cabinet into another useful item for your home. You can’t just cast it aside! We actually gave it away to someone that needed it for free. So it got a second life! When I first saw it, before you had it in place and styled, I wasn’t sure, but I absolutely love it. It’s perfect for the space and warms it up. I agree that the metal doors coordinate so well with the metal of your barn doors. Good call! Thanks Kathy! I love how it all came together. That is the coolest console I’ve ever seen!!!!!!! Isn’t it neat Dina?! Definitely a fun and unique piece. Love it! 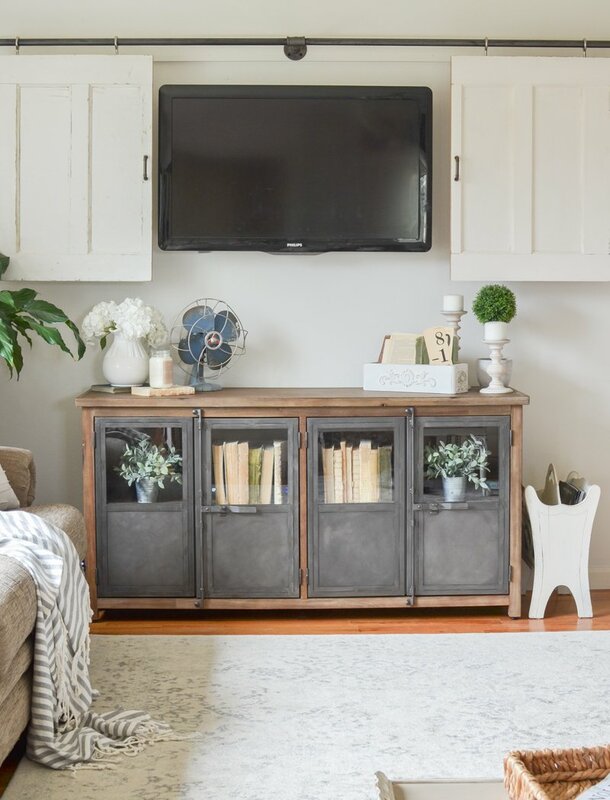 I love the industrial/farmhouse look! It looks so good. I love the black doors on it and how it adds so much contrast to your room. Thanks Brenda, I think this room really needed that contrast. What a huge difference that makes in your space. I love the new console so much! I never really cared to much for the old one mainly because I thought there was too much white. This definitely has the rustic industrial vibe that trypuly matches the door hardware. I don’t really like paying that much for a console either but when you find something like that…well that’s makes a huge difference. I would pay that for this item. It’s just got so much charm! I agree Shirley, there was too much white with the old one. This is a much better fit and it gives this space so much more warmth! Love it Sarah, It looks amazing! 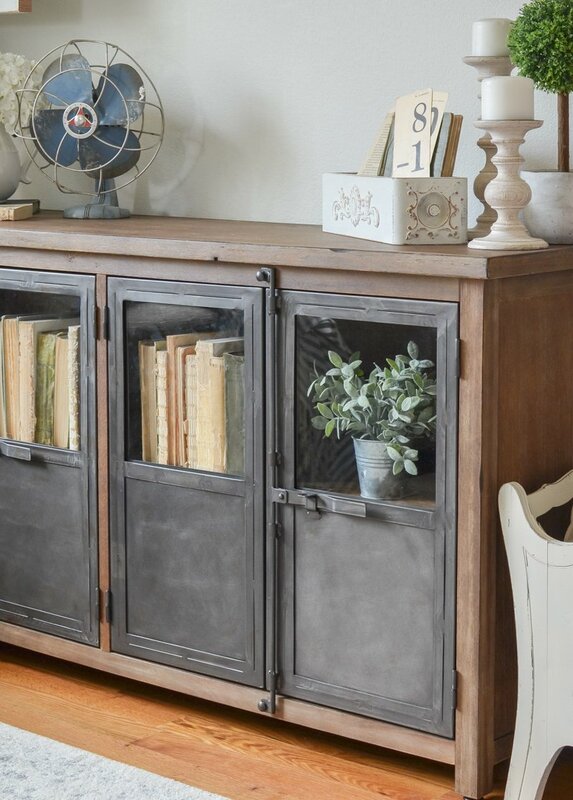 Love the cabinet as wells the barn doors! Love the cabinet. Please. Where did you purchase it? ?